The market has worked hard to find fair value, which amid ever-higher US and world ending stocks estimates was bearish. However, fair value seems to have been found, and ahead of a growing season, our work suggests that it doesn’t be to be short. 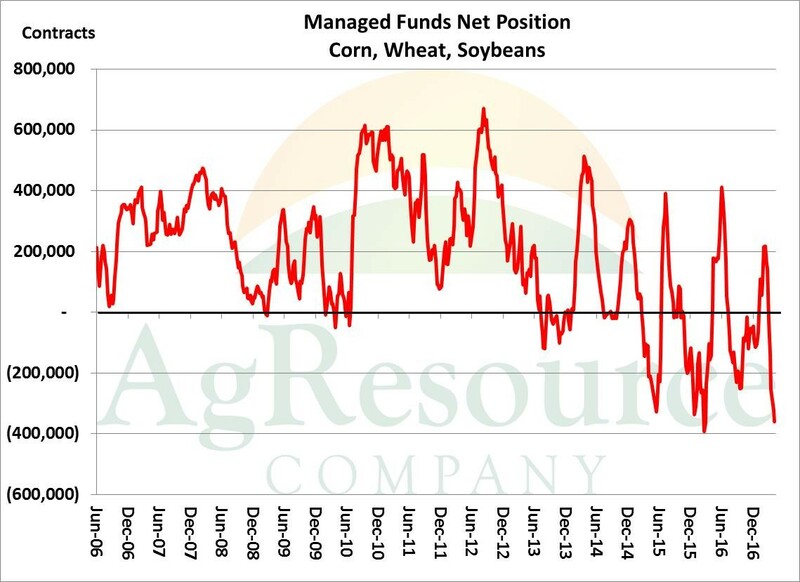 Managed funds are again heavily short in ag markets, and as of last Tuesday the combined position in corn, wheat and soybeans stood at 360,000 contracts, vs. 323,000 in the previous week and compared to a short position of just 119,000 contracts on this week a year ago. So, there’s too much supply, but nearly the whole of the speculative community is short. 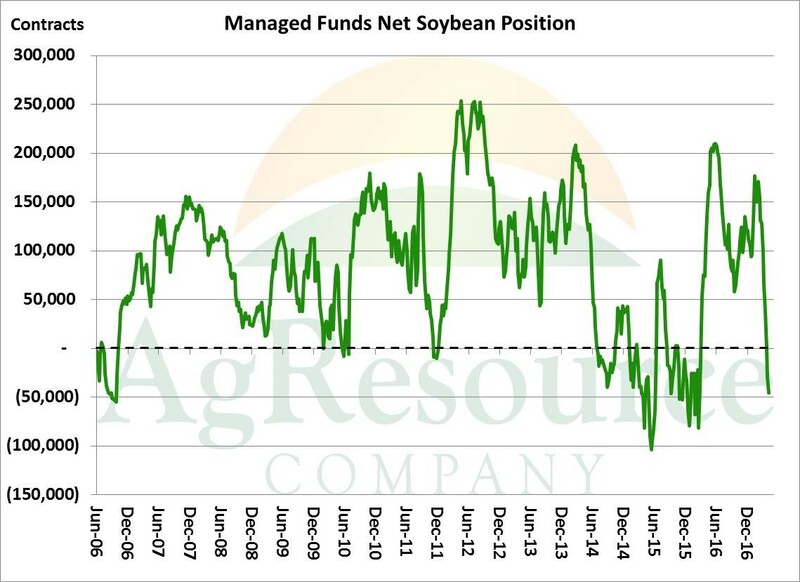 Managed funds have even established a modest net short position in soybeans, after weeks and weeks of defending a moderate to sizable net long. As of last Tuesday funds were short 46,000 contracts of beans, vs. 30,000 a week earlier and compared to a net long position of 135,000 contracts a year ago. 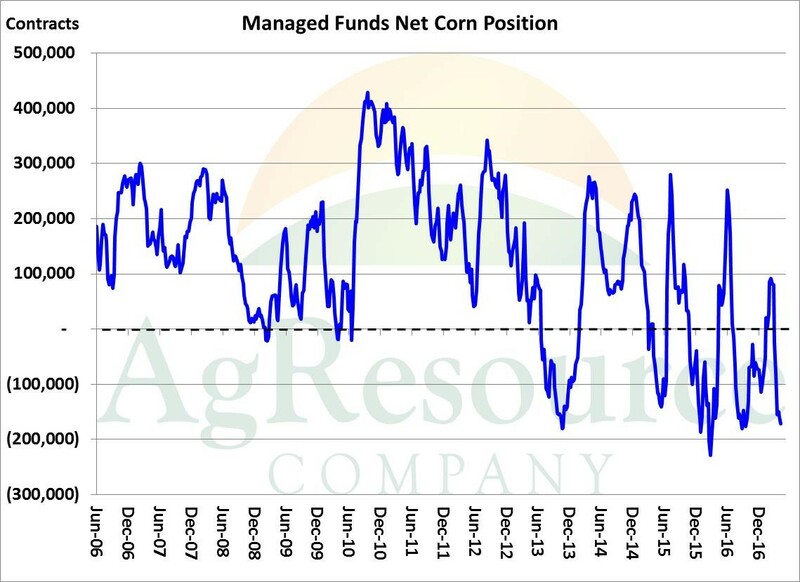 And funds’ net short in CME corn futures is nearly record large at 172,000 contracts, which compares to a net short of just 30,000 contracts a year ago, and we estimate their position as of today at closer to 185,000 contracts. This is a rather large short position, particularly ahead of a Northern Hemisphere growing season. It remains that a major change in US and world balance sheets is needed to alter the structure of grain markets – to turn then them bullish, especially – but the market looks to be out of sellers currently. The farmer, of course, is very inactive at current prices, while spec traders have now accounted for this year’s South American surpluses and eroding US drought. Any sign of adverse weather in the US, Europe or Black Sea could trigger a fairly dramatic reaction in the markets, at least short term.